We are all conscious of the need to conserve natural resources. But how conscious are you of the need to conserve and protect your own personal physical resources? Most of us, especially when we are young and enthusiastic, think that we are invulnerable, that we are ten feet tall and bulletproof. We work hard as we strive to build a practice and a life. I personally worked crazy hours seeing a ridiculous number of patients per day with no thought of the toll it was taking on my own body. I was not alone — most of my friends were doing the same thing. We were hooked on the ego trip of being able to attract a high volume of patients. We were making a lot of money and most of us were living up to it, buying expensive toys, working hard and playing hard. It was a rude awakening when one morning my body staged a revolution. I suddenly found myself on the floor in excruciating pain as I was adjusting a 120 lb. woman. I had heard of this sort of thing happening to other chiropractors, but of course never thought it would happen to me. The fact is that traditional full spine adjusting, or as I have come to call it — Full Contact Chiropractic — is indeed a rough game. I was amazed when my friend Ed Miller, owner of Impac, Inc.®, told me that the chiropractic profession has an attrition rate similar to professional football – and for the same reason — injuries. Tragically, many disabling injuries apparently occur during chiropractic school, well before the DC degree can even be awarded. That is very sad and unnecessary. I wish these hand held instruments had been available when I was starting out. If they had been my spine might not look like this (see x-ray). This is a perfect example of long term repetitive motion injury. Being a chiropractor shouldn’t mean that we have to sacrifice our own health or live in pain to help others. That is not a fair exchange. I live with pain every day because of my past excesses, thinking I was superman. The good news is that if you are a young DC, you won’t have to hurt yourself to help your patients. This is one of the big benefits of instrument adjusting – it helps to keep you off the injured list. I can still enjoy practicing today, after almost 50 years, because of this kind of advanced chiropractic technology. If I had to practice the way I did for my first 30 years, I simply could not do it. In the past several years I have interviewed some of the contemporary masters of chiropractic technique. Each of these doctors takes advantage of the benefits of instrument adjusting, having developed their own methods and techniques which utilize modern instrument adjusting. Each of the techniques I discuss are “doctor friendly” in that they are easy on the doctor’s body. 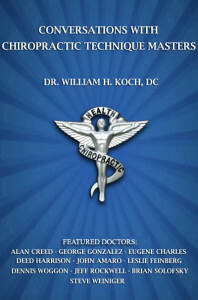 The book will also be available at the Florida Chiropractic Association’s National Convention, August 21-24, 2014 in Orlando, Florida where I will be speaking. Those who attend my course will receive a free copy of the book which they can pick up at the Impac®, Inc. booth. I will be spending a lot of time at the Impac® booth giving demonstrations, signing books and answering your questions. I look forward to meeting you there. My presentation is scheduled for Friday the 22nd from 10:20 AM to noon and is titled, “Back to Basics: Practice from Above Down/Inside Out.” I will be discussing the importance of the initial consultation in establishing the doctor/patient relationship; and will then demonstrate the way I examine and treat a new patient using an interactive, multi-technique approach that actively engages them in every step.